Herb, usually free-floating but occasionally rooted in mud, 4-40 cm. Leaves 4-8, clustered on short rhizomes, erect, very variable; in free-floating plants: petiole 5-10 cm, markedly swollen below; lamina 4-9 cm wide, ovate to circular; in older plants rooted in mud, the petiole is longer and not swollen. Inflorescence a c.8-flowered showy spike, raised above leaves. Perianth tube 20 mm, curved; limb 5-7 cm in diameter, slightly 2-lipped, pale mauve with the central lobe broadest with large blue area and central yellow spot. Notes: A serious invader, rapidly colonizing and blocking waterways through extensive vegetative reproduction by means of floating stolons. Derivation of specific name: crassipes: thick-footed or thick-stalked. Habitat: Most often free-floating on the surface of dams and ponds, sometimes rooted in mud. Worldwide distribution: Tropical and subtropical America and widely naturalised throughout the tropics. Bandeira, S., Bolnick, D. & Barbosa, F. (2007). Wild Flowers of Southern Mozambique Universidade Eduardo Mondlane, Maputo, Mozambique Page 53. (Includes a picture). Catarino, L. & Martins, E.S. (1996). The Pontederiaceae of the Flora Zambesiaca Area Kirkia 16(1) Pages 23 - 24. Catarino, L. & Martins, E.S. (2010). Pontederiaceae Flora Zambesiaca 13(2) Pages 72 - 74. Da Silva, M.C., Izidine, S. & Amude, A.B. (2004). A preliminary checklist of the vascular plants of Mozambique. Southern African Botanical Diversity Network Report No. 30 Sabonet, Pretoria Page 162. Henderson, L. (2001). Alien weeds and invasive plants Plant Protection Research Institute Handbook No. 12. Plant Protection Research Institute, Agricultural Research Council, South Africa. Page 21. (Includes a picture). Henderson, L. & Cilliers, C.J. (2002). Invasive Aquatic Plants Plant Protection Research Institute Handbook No. 16. Plant Protection Research Institute, Agricultural Research Council, South Africa. Pages 10 - 15. (Includes a picture). Pickering, H. & Roe, E. (2009). Wild Flowers of the Victoria Falls Area Helen Pickering, London Page 99. (Includes a picture). Pooley, E. (1998). A Field Guide to the Wild Flowers of KwaZulu-Natal and the Eastern Region. Natal Flora Publications Trust. Durban. Pages 448 - 449. (Includes a picture). Wild, H. (undated, c. 1955). Common Rhodesian Weeds ?Government of Rhodesia, Salisbury Page 10. (Includes a picture). Bingham, M.G., Willemen, A., Wursten, B.T., Ballings, P. and Hyde, M.A. (2019). 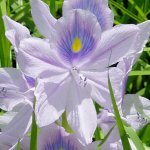 Flora of Zambia: Species information: Eichhornia crassipes.